My daughter Kristina and I always say the same thing every year: Once it is Halloween, Christmas is here. It seems like after Halloween, time flies and the heavy cooking begins. It’s during this busy yet wonderful time of the year that I look for make-ahead recipes that can be prepared either at least a day or two ahead or frozen well ahead of time. I have many traditional favorites but still on the look-out for new ideas. This appetizer is so easy and can be made a day ahead or early in the day before serving. 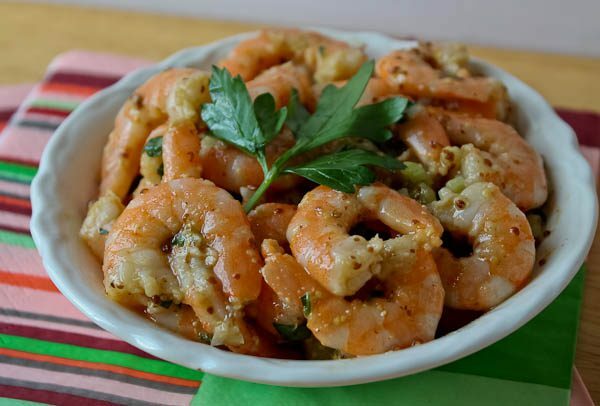 Cooked shrimp is simply marinated in a delicious combination of Creole mustard, cider vinegar, olive oil, paprika, scallions, celery, salt, and white pepper. When ready to serve, spoon into a bowl, offer toothpicks, and watch them disappear! This would be a great appetizer for Thanksgiving this week. I like having other meats or seafood for appetizers since turkey is the main part of the meal. Shrimp is not filling, gluten-free, and is lower in calories than something like a heavy dip with crackers. Prepare shrimp: Peel and devein shrimp. Place in a saucepan and add enough cold water to come about 1-inch above the shrimp. Add 2 slices lemon and 1 Tablespoon salt. Bring the water to a boil, then simmer about 30 seconds. Remove from heat and drain. Allow to cool. If not using immediately, cover to prevent drying. For marinade: Combine the mustard and vinegar in a bowl that will fit the shrimp. Using a wire whisk, beat in the olive oil, paprika, salt, and pepper. Stir in the green onion, parsley, and celery. Add the shrimp and stir well to coat. Cover and refrigerate at least two hours so that the sauce permeates the shrimp. When ready to serve, mix again and place in a decorative bowl. Provide toothpicks. Serves 8-10. Garnish with parsley sprigs, if desired. Yum! 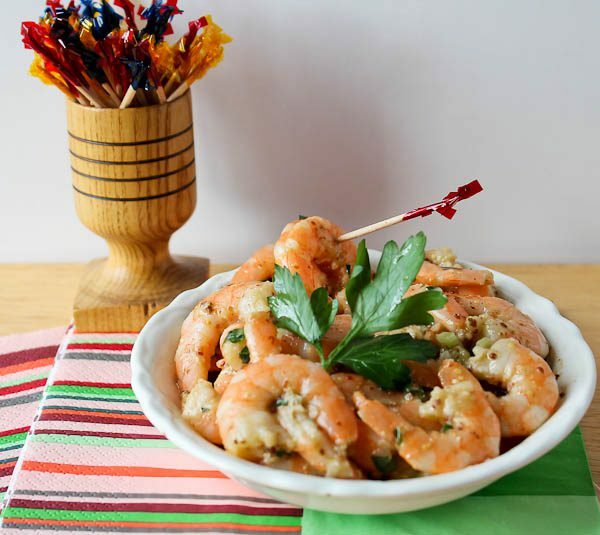 We love shrimp and can’t wait to try this recipe. Missed the opportunity to serve it at Thanksgiving but definitely will serve it over the Christmas holidays. Thanks!